It’s early days to draw conclusions from any of this, and I have time today only to lay out the bare bones of it. There are several important links in the text, with superb work done by foreign journalists/bloggers Brian Whitaker (of the Guardian), Jon Worth, and Chris Blackburn, which will allow you to read more at your discretion. George Papadopoulos is one of Robert Mueller’s big prizes so far: a campaign aide of Donald Trump who entered a plea to a process crime (making false statements), committed in the course of interviews with the FBI. Papadopoulos was never under suspicion of committing any crime related to the Trump campaign or the election. The central figure in this chapter of the ongoing drama is Joseph Mifsud, the Maltese professor who reportedly told George Papadopoulos in April 2016, in London, that the Russians had obtained thousands of Hillary Clinton’s emails. Papadopoulos later got drunk and passed that tidbit on to Australian diplomat Alexander Downer, who eventually relayed the information to contacts in the U.S., after the DC Leaks/“Guccifer 2.0” leak of the emails from John Podesta and the DCCC began on 22 July 2016. Since the centrality of his role became known, Mifsud – formerly a high-profile “man about the Mediterranean” – has disappeared from public view. Indeed, he has disappeared to the point of breaking off contact with a Ukrainian woman who recently had a child with him, and whom he had asked to marry. The 57-year-old Mifsud is thought to be in Russia. 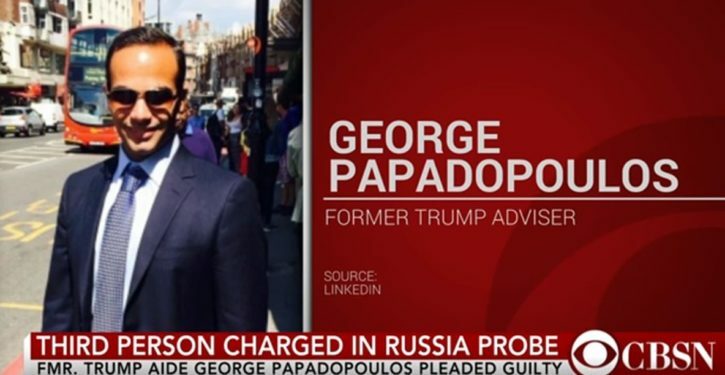 But he is a Maltese national, and his connection with Papadopoulos was through organizations in London and Rome for which the Russian contacts appear to be minimal, in the former case, and somewhat significant but not obviously essential in the latter. The short version is that Papadopoulos was affiliated briefly, in March and April 2016, with a strange London organization called the London Centre of International Law and Practice (LCILP). March 2016 was also when his position as a foreign policy adviser to the Trump campaign was established. Before hooking up with ICILP, Papadopoulos had worked briefly for the Ben Carson campaign, until it ran out of gas. Papadopoulos was a walk-on for Carson, and apparently for Trump as well. Coming into LCILP with the thinnest of resumes, Papadopoulos somehow managed – apparently almost immediately – to be named LCILP’s Director of the Centre for International Energy and Natural Resources Law & Security. Joseph Mifsud was also affiliated with the LCILP at the time, although virtually all references to him have been scrubbed since, and were retrievable to researchers over the last three months only via archived versions of web pages. Unfortunately, most of the archived versions have now been scrubbed as well. Mifsud’s title with LCILP in 2016 was Director for International Strategic Development. As late as 30 November 2016, he was listed as a “board adviser.” The first documentable event held by LCILP was apparently in 2014. More on LCILP in a moment. Mifsud’s checkered career as an academic seems to have consisted of a lot of similar episodes, hopping from position to position with newly emerging but somewhat sketchy organizations, short on substance but with links to legitimate institutions of longstanding. Besides LCILP, Mifsud was for several year the president of EMUNI, the Euro-Mediterranean University, founded in 2008 in Slovenia. EMUNI is not what Americans would think of as a “university.” It’s more of a study program broker, mostly arranging study programs with partner universities where the teaching actually occurs. But evidence is slim for LCILP (as opposed to Mifsud himself) having a particular connection with Russia. What we might call Mifsud’s “day job” in the UK has a similar not-particularly-Russia-connected appearance: that is, the London Academy of Diplomacy (LAD). LAD seems to have been more of a fly-by-night operation than LCILP (in spite of a rather slurpy puff piece about it and Mifsud in the Washington Diplomat in December 2014. There is a video with highlights of a graduation ceremony from 2012, apparently of the first batch of “vocationally tutored” students, who entered in 2011). But Mifsud was running it under the aegis of the University of Stirling (and before that of East Anglia). The few people who worked there recently remember qualities similar to those of the LCILP: suspiciously little seeming to go on, and Mifsud being a rather vague, secretive fellow. LAD apparently was all but shuttered about the time Mifsud’s role in baiting Papadopoulos was revealed, although one researcher said it still has an active (if rudimentary) website. Note: there is a “Diplomatic Academy of London” which is a separate and unrelated institution. There’s a lot more to say about all the organizations Mifsud was involved with. But to keep this tight, I will commend the links to your perusal, and move on to the main points. The first of them is that Mifsud has been a close friend for some time to an Italian politician, Gianni Pittella. Pittella, a Socialist, was a member of the European Parliament for a number of years, but resigned just weeks ago with the intention of participating in Italy’s new government (however it shakes itself out). Moreover, George Papadopoulos’ fiancée, Italian national Simona Mangiante, was introduced to Joseph Mifsud by Pittella, whom she knew starting about 2012, from working at the European Parliament in Brussels. Mifsud recruited her in 2016 to work at the LCILP, and although she arrived several months after Papadopoulos’ brief tenure ended in April, Papadopoulos – back in the States – was apparently keeping up with LCILP events via LinkedIn, and contacted Mangiante in October of 2016 to propose a meeting, because he “liked her picture.” Eventually they did meet face to face, and in 2017 became engaged. Mangiante worked at the LCILP for at least two months but was never paid her promised salary, and ended up quitting. For her trouble, she got to spend part of 2017 answering questions for the FBI. So it is extremely interesting that Gianni Pittella, Italian Socialist, MEP, and close associate of Joseph Mifsud, has gone on record as a passionate Trump-hater, accusing him in January 2017 of exploiting Britain and Brexit as a “Trojan horse” to destroy the EU. Pittella added, “This is not a normal election between a Democrat and a Republican candidate. There is much more here at stake: US democracy, peace and stability in the world and transatlantic relations. Something that interests me is how many leftist bloggers and pundits I see recounting these facts with an air of puzzlement, because they can’t make the facts fit the theory that it’s Trump who’s involved in an international plot. This whole thing looks more like a set-up of (or through) George Papadopoulos, to get to Trump and dirty him up by dangling bait. If there’s an international plot, it keeps pointing back toward Hillary and other Democrats. The other point in this post is (part of) the rest of the story on the LCILP. The Guardian’s Brian Whitaker picked up on it in a blog post in December 2017. He wasn’t having a lot of luck making a good story out of LCILP’s Russia connections, other than through Joseph Mifsud himself (i.e., his link to Valdai Clubber Ivan Timofeev, who figured in the Steele dossier. Mifsud’s Russian links through Link Campus are also potentially of interest, but more as a general matter than as specifically applicable to the dossier narrative). 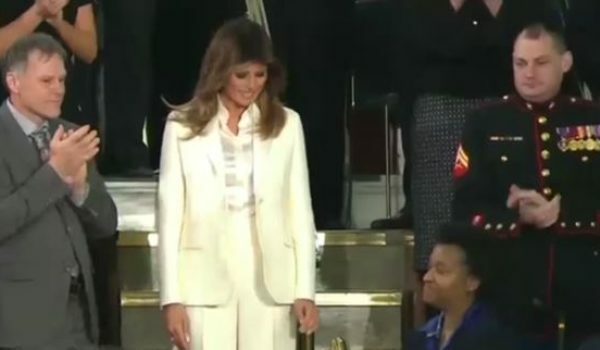 There seemed, however, to be an interesting level of LCILP connection to some Arabs and other Middle Easterners – and in particular, to a high-profile Saudi attorney who runs his own firm in Saudi Arabia, as well as sponsoring the Saudi Law Training Center (SLTC). 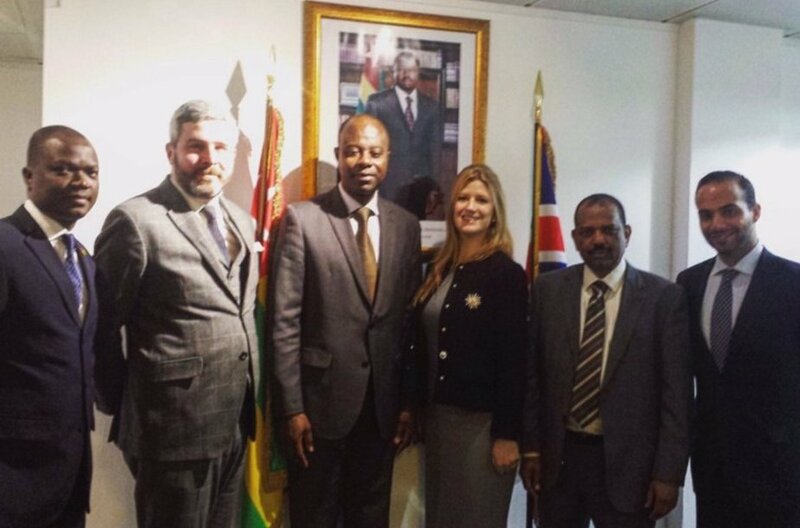 Whitaker points out that the Saudi lawyer, Majed Garoub, is also linked to another LCILP figure, Nagi Idris (a Sudanese Brit), who at the time of Papadopoulos’ employment there was LCILP’s director (he seems to have relinquished that title), and is listed as a consultant at Garoub’s Saudi law firm. And Garoub attended the one LCILP conference at which Papadopoulos was a participant, in March 2016. As with the rest of this saga, there is a lot more to recount. 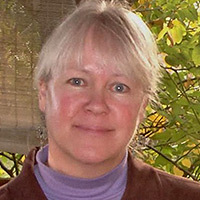 Nagi Idris is also listed as a visiting professor at Link Campus in Rome, for example. And he’s a multifarious fellow whose other holdings would take weeks to track all the threads from. 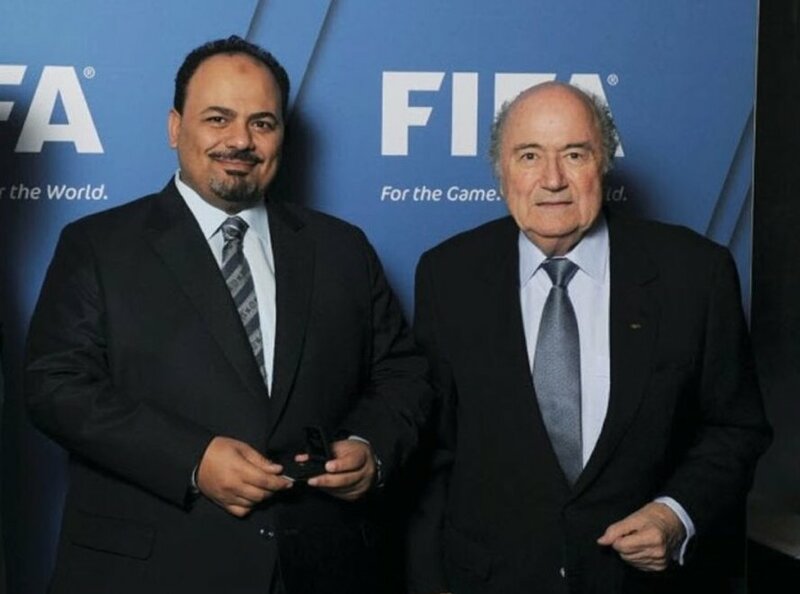 But what jumped out at me from Brian Whitaker’s December 2017 post was a photo of Majed Garoub with Sepp Blatter, the former head of FIFA, the international soccer (football) association. Blatter had to step down in 2015 because of the bribery and corruption case the U.S. Department of Justice was able to make against the Association, with the help of none other than dossier author Christopher Steele. There’s a reason Garoub was photographed with Blatter. Garoub’s firm offers a specialty in sports law, and Garoub himself was a member of the FIFA Legal Committee at the time of the bribery scandal (which involved Russian as well as other actors). Garoub may have no connection to most of the U.S. figures in this drama. 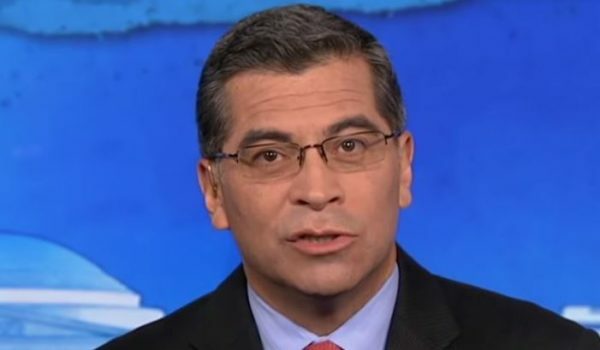 His connection is to the LCILP, to Nagi Idris, and implicitly to Joseph Mifsud, who was prominently linked to the LCILP. 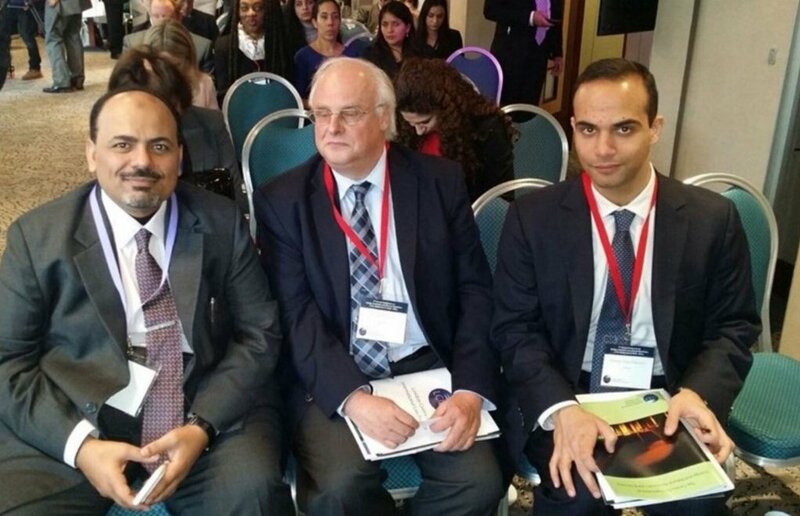 Garoub may well have done no more than attend the March 2016 conference in which Papadopoulos participated, and shake his hand and exchange a few pleasantries. The more layers are peeled off of this thing, the less the actions of the team that’s been “investigating” Trump look like happenstance. Each new piece of the puzzle looks like something two or more of them had extensive prior knowledge of, whether it’s what Russian oligarchs do for fun and profit, which Russian oligarchs do what, which academically-challenged “academics” caper about Europe buddying up to inexperienced young professionals, where to get good kompromat from Russian sources, and where the paths start, to get to all these people – even if they may start hundreds or thousands of miles from the ultimate target. More to come, we can be certain.